Charles Kirkpatrick - President of Kirkpatrick & Co., Inc., a specialist in technical research. Author of "Beat the Market: Invest by Knowing What Stocks to Buy and What Stocks to Sell". 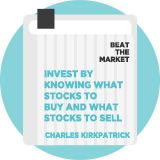 Here follow a selection of stock screening strategies that we have modelled based on the writings of or about Charles Kirkpatrick. These strategies are not endorsed by the author.